There’s going to be trouble. Andy Caplet’s wife goes away, someone is out to get him, and he loses nearly everything in a storm. Amazing both himself and his unhuman friend Inspector Hobbes, he heroically rescues flood victims and uncovers something shocking. Is Andy being set up for blackmail by the apparently charming young woman who attempts to seduce him, or is something even more sinister afoot? Hobbes certainly believes so, and he’s getting worried. This is the fourth in Wilkie Martin’s unhuman series of cosy comedy crime fantasies. 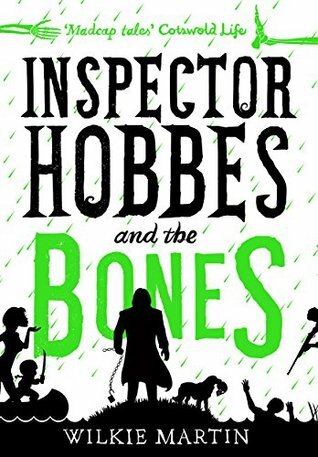 Inspector Hobbes and the Bones is marketed as “This is the fourth in Wilkie Martin’s unhuman series of standalone cosy comedy crime fantasies” and that it’s not necessary to read the other books in the series and I’m sorry to say I disagree slightly. While it isn’t 100% necessary to read the preceding books as the narrative from Andy Caplet – a slightly eccentric and clumsy reporter – does give insight into the previous escapades of Inspector Hobbes and Andy Caplet, it isn’t brimming with information to explain them – little bits here and there that give you the general jist of the antics. I will say that this book had the comedic value I was looking forward to and it came from various characters and situations – Inspector Hobbes and Mrs Goodfellow have a distinct sense of sarcastic humour that I quite liked, Featherlight another “unhuman” was also quite comedic but I don’t think it was supposed to be intentional. One thing that wasn’t really explained in the book was what the term “unhuman” actually covered. There’s a vampire, a dwarf, some sort of nature fae and the sly ones and then there’s Hobbes himself who appears to be some sort of werewolf/shape changer creature but you don’t see him actually change his shape, only hear of him feasting on several raw bones when he’s feeling particularly agitated. Mrs Goodfellow is also an oddity with what appears to be the ability to appear at will, immense cooking skills and the strength of 10 men not to mention the fact that she appears to be immortal. All kinds of mishaps happen to Andy in this book – his wife goes on an archaeological dig in Egypt, he almost gets hit by a car, he gets kissed by his saviour, he’s shot, his flat gets totally destroyed, he gets beaten up the list goes on. There’s so much happening to this dude that there isn’t really much of a story line to go on – my opinions are based on the overwhelming amount of bad things happening to one character that it (and his crazy need to eat and describe everything he eats) kind of detract from the actual story. The plot includes a flood (believable though it is) and the subsequent mishaps of a flood followed by the discovery of some bones and thus we come to our title. Old bones mixed in with new bones because there happened to be an ancient ossuary in the area near a culvert where the new bodies were thrown whose blockage apparently caused the flooding – not quite as believable when you consider that this one culvert flooded the entire town. Anyway, a storm that caused the flood destroyed poor Andy’s house so he moves back in with Hobbes and this is where his entire life goes to hell and he disregards his responsibilities to go gallivanting off with Hobbes and a precocious dog named Dregs. From there the book gets a little less comedic and a touch more serious but still with the underlying comedy value which was good. The ending of this book made the beginning and middle make more sense than it originally did, a lot of what happened to Andy and what he went through was because of the fae, which was quite nifty because he didn’t even realise it until Hobbes told him otherwise. I didn’t think much of Andy, he thought too much about food and not his actual important things. Despite the niggles and the relatively unexplained situations from previous books, I quite enjoyed this book for its comedic value and the writing style not necessarily the content it contained.